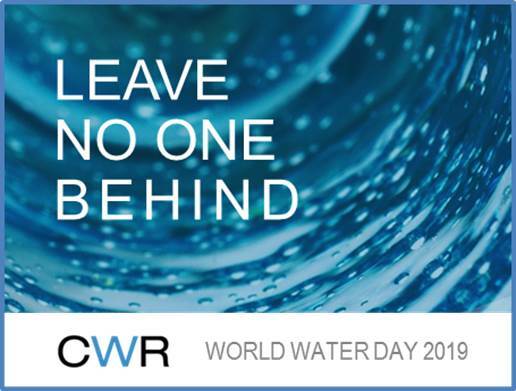 The theme this World Water Day is “Leaving no one behind”. Yet, 2.1 billion people – around 30% of the global population – still live without safe water (‘safely managed drinking water service’: water that is accessible on the premises, available when needed, and free from contamination). …with such funds being raised, why haven’t we solved universal access to water? The cost of delivering universal clean water… USD150 billion per year. This sounds like a lot but it is only 0.8% of the US’ GDP in 2017 and 1.2% of China’s. Another way to look at it is that USD120.2 billion of green bonds were certified by the Climate Bonds Initiative in 2017 and the USD100 billion issuance mark was passed in September in 2018. With such funds being raised, why haven’t we solved universal access to water? By not achieving this, we are jeopardising our ability to accomplish Sustainable Development Goal (SDG) 6: ensure availability and sustainable management of water and sanitation for all by 2030. And more broadly, global economic growth, security and health. 2030 is a key deadline, not just for the SDGs but for climate change, which we know exacerbates water scarcity. According to the “2018 Emissions Gap Report”, CO2 emissions are now rising after a four year plateau. It warns that if we don’t close the emissions gap by 2030 it is “very plausible” that the goal of well-below 2°C will not be reached. The time for bold & out-of-the box thinking is now. And it’s not just up to the big carbon producing guys like energy & food to transform and put us on the right trajectory. Fashion matters for the climate with huge forecasted CO2 emissions, people matter to through changing their diets & lifestyles. We are all in it so, it is time we all act. This is even more the case in Asia where limited water resource availability simply dictates a business unusual future. Moreover, a UN report says that Asia Pacific is falling behind on two thirds of SDG targets. SDG 6 is one of the least progressed goals. We are clearly behind. We need to do better. As it is, water refugees are already on the rise, as is water-related conflict. 700 million people worldwide could be displaced by intense water scarcity by 2030. And by 2100, climate change will force mass global migration of over 1 billion people, with the Asia-Pacific region identified as the most vulnerable. We have clear evidence of how water is already disrupting lives, business and countries around the world. Of course, everyone knows about “Day Zero” in South Africa. Then there are the droughts & floods that have destabilised Kenya; from having to walk long distances for water to then floods that displace hundreds of thousands of people. Meanwhile, in Eastern Ukraine civilian water infrastructure has been a target during the country’s ongoing conflict and most recently in the news, Manila’s water supply crisis. Manila Water had a 140 million litres shortage daily, which has led to dozens of villages and city districts having their water cut off for days. To blame, apparently infrastructure delays, rising demand and the onset of summer shrinking supply from dams. Residents, business, hospitals have all been impacted. The shortage is said to be resolved in June, some two plus months from now. It isn’t just developing or conflict countries that are going to suffer from water disruptions. Around 4 billion people globally experience severe water scarcity during at least one month of the year. Tokyo now experiences a dry spell nearly every decade, which is spurring water worries. And in London, the city’s water demand is expected to exceed its supply within the next decade while the whole of England could “run short on water” in 25 years. In short, water refugees are going to become more common unless we get our act together. Clean access to water may not be a “poor” or “rural” problem anymore. Even we, living in cities, could be left behind. We need to build resilient infrastructures to deliver clean water for all in a 3 degree world. And by “we” we mean everyone – governments, business, investors, think tanks, academics, NGOs, the military, average joe, golf clubs… simply everyone.